Over the past few weeks, I have been reading two very good books about data visualization. The first is Cole Nussbaumer Knaflic’s book Storytelling with Data and the second is The Big Book of Dashboards by Steve Wexler, Jeffrey Shaffer and Andy Gotgreave. I found both of these books very enjoyable to read and picked up a lot of useful ideas for developing my own visualizations. This topic is extremely fascinating to me and I think these are nice resources to have in your library. Storytelling with Data is a guide to presenting data in an effective manner and covers several topics related to choosing effective visuals, telling compelling stories and thinking like a designer. This book does not specifically describe the bullet graph but does introduce some of the concepts and ideas as to why this graph is effective. Because I enjoyed this book so much, I checked out the Storytelling with Data Website which recommends the Big Book of Dashboards book; naturally I had to add it to my library. The Big Book of Dashboard is an extremely valuable resource for anyone that finds themselves trying to build a dashboard for displaying complex information. In Wexler, Shaffer and Cotgreave’s book, the authors go through an in-depth analysis of 28 different dashboards and explain why they were developed, how they are used and ideas to improve them. The book is very visually appealing and densely packed with great ideas. It is a resource that can be read straight through or quickly browsed through for inspiration. I have really enjoyed each of these books. I am convinced that there would be a lot better data visualizations in the world if all the Excel and Powerpoint jockeys had both of these books on their desks! The Big Book of Dashboards introduced me to the concept of a bullet graph (aka bullet chart) and I found the concept very interesting. I immediately thought of several cases where I could use it. 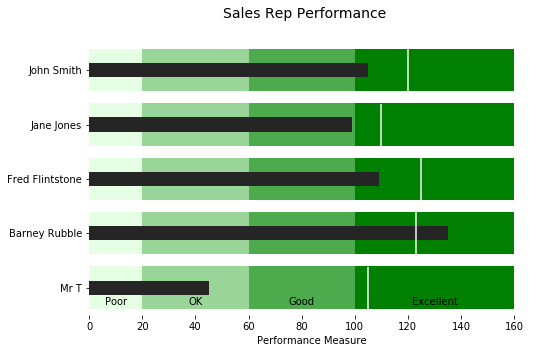 The bullet graph features a single, primary measure (for example, current year-to-date revenue), compares that measure to one or more other measures to enrich its meaning (for example, compared to a target), and displays it in the context of qualitative ranges of performance, such as poor, satisfactory, and good. The qualitative ranges are displayed as varying intensities of a single hue to make them discernible by those who are color blind and to restrict the use of colors on the dashboard to a minimum. Both of these books are tool agnostic so there is not any significant discussion related to how to create these visualizations. I could find examples in Excel but I wanted to see if I could create one in python. I figured if I had existing code that worked, I would be more likely to use it when the time was right. I also like the idea of making this easy to do in python instead of struggling with Excel. I did some searching but could not find any python examples so I set out to create a reuseable function to build these charts using base matplotlib functionality. I am including the code here and on github in the hope it is useful to others. Feel free to send me pull requests if you have ideas on how to improve it. The idea for the bullet chart is that we can use a stacked bar chart to represent the various ranges and another smaller bar chart to represent the value. Finally, a vertical line marks the target. Sounds simple enough, right? Since this is a somewhat complicated layer of components, I think the simplest way to construct this is using matplotlib. 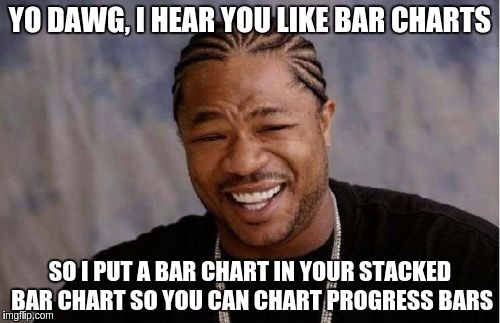 In the sections below, I will walk through the basic concepts, then present the final code section which is a little more scalable for multiple charts. I am hoping the community will chime in with better ways to simplify the code or make it more generically useful. I recommend that you run this code in your jupyter notebook environment. You can access an example notebook here. Astute readers may be wondering why we are including seaborn in the imports. Seaborn has some really useful tools for managing color palettes so I think it is easier to leverage this capability than trying to replicate it in some other manner. The main reason we need to generate a palette is that we will most likely want to generate a visually appealing color scheme for the various qualitative ranges. Instead of trying to code values by hand, let’s use seaborn to do it. This functionality makes it convenient to create a consistent color scale for as many categories as you need. Now that we now how to set the palette, let’s try to create a simple bullet graph using the principles laid out in the Effectively Using Matplotlib article. This actually works pretty well but is not very scalable. Ideally we should be able to show multiple bullet graphs on the same scale. Also, this code makes some bad assumptions that do not scale well as the values in the range change. I am not going to go through the code in detail but the basic idea is to create a subplot for each chart and stack them on top of each other. I remove all the spines so that it is relatively clean and simple. I think this is a nice way to compare results across multiple individuals and have a good sense for how they compare to each other. It also shows how values compare to the other quantitative standards we have set. It is illustrative of how much information you can quickly glean from this chart and that trying to do this with other chart types would probably not be as effective. One other nice thing we can easily do is format the x axis to more consistently display information. 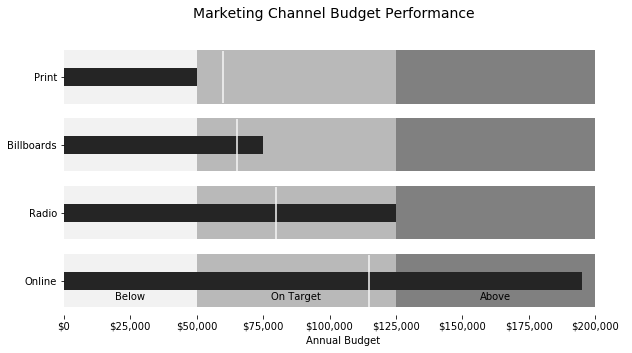 In the next case, we can measure marketing budget performance for a hypothetical company. I also chose to keep this in shades of gray and slightly changed the size variable in order to make it look more consistent. The proliferation of data and data analysis tools has made the topic of visualization very important and is a critical skill for anyone that does any level of data analysis. The old world of Excel pie charts and 3D graphs is not going to cut it going forward. Fortunately there are many resources to help build that skill. The Big Book of Dashboards and Storytelling with Data are two useful resources that are worth adding to your library if you do any level of data visualization. The Big Book of Dashboards introduced me to the bullet graph which is a useful format for displaying actual results vs various targets and ranges. Unfortunately there was not an existing python implementation I coudl find. The fairly compact function described in this article is a good starting point and should be a helpful function to use when creating your own bullet graphs. Feel free to send github pull requests if you have ideas to make this code more useful. 7-May-2018: An example via Bokeh is now available in this post.